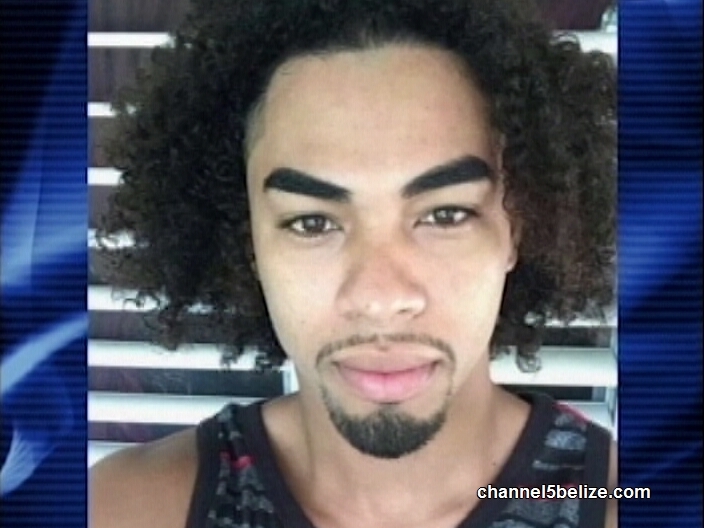 On Sunday, August 6th at around 9:05PM San Pedro Police visited the Dr. Otto Rodriguez San Pedro Polyclinic II where they found 21-year-old Kevin Brown in an unconscious state. According to the initial investigation, Brown was at a resort with a group of friends when a dispute arose over a piece of jewellery. As a result someone from the group kicked him and then hit him with a fire extinguisher causing him to become unconscious. 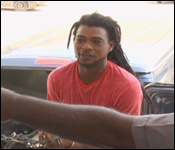 After being transported to the clinic, Brown was then airlifted to Belize City for further medical treatment. Police are investigating and seeking one person for questioning. As we told you last night, 21 year old basketballer Kevin Brown is at home in Camalote recovering after a massive blow to the head which happened in a brawl on Sunday night in San Pedro. According to eyewitnesses, Brown and about three other friends were mobbed by a group of 20 men. Eyewitnesses tell us that he was punched out and then someone threw a vase on his head - even though initial reports said that he had been hit with a fire extinguisher. 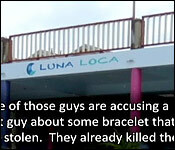 The dispute was all over a bracelet, and police have surveillance video of the fracas which happened near Banana Beach resort. 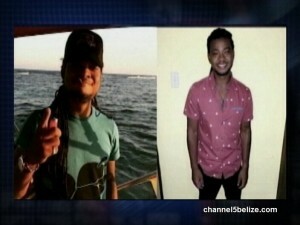 Witnesses tell us that the dispute was with some well known young men from Belize city - one of whom has reportedly left the country. We'll keep following the story. 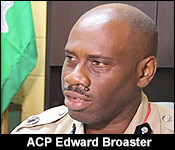 Media Relations Officer, Inspector Fitzroy Yearwood, has been transferred from the Police Press Department. The sudden transfer has raised eyebrows as the media was informed this morning when inquiring about the investigation of the aggravated assault in San Pedro over the weekend. Incidentally, Inspector Yearwood had released the updated police report on this incident on Wednesday which included that Police were seeking the Castro brothers for questioning. 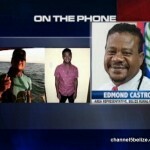 This morning, upon requesting updates on the status of the investigation and whether police were able to locate the Castro brothers; we were informed by Press Officer for the Police Department, Raphael Martinez, that “Apparently there was no report made against them” and that the previous report by Yearwood was incorrect. Martinez then informed the media that Yearwood was no longer working with the Police Press Department. The only explanation provided is that "Police officers are transferable." And we all wonder why crime is increasing in the entire country! Last edited by dabunk; 08/10/17 03:04 PM. Hmmmm..........that makes two seriously violent incidents in the past few weeks at BB. It seems my old haunt may soon be my ex-old haunt. What gives? Kevin Brown’s Beatdown, An Eyewitness Account All this week, Kevin Brown's name has been in the news. He's the 21 year old basketballer from Camalote village who was hit over the head in a brawl in San Pedro Town on Sunday night. While he recovers, police still have not arrested the man or men who beat him. It was a brawl on the island - all because of a bracelet. Tonight, for the first time we'll hear the account of an eyewitness - one of Brown's friends - who says that first there was a fight at the Luna Loca in San Pedro - that was the prelude to the bigger brawl. But the male witness fears for his safety, and so It's only a voice interview WHICH HE GAVE TO PLUS TV and his voice has been altered to mask his identity. "One of those guys are accusing a next guy about some bracelet that was stolen. They already killed the vibes of the party and everybody just...you know, said, let us try to get out of this place." 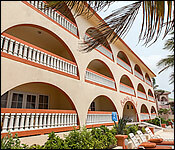 "So after that we went in our golf cart and we had to drive to Banana resort. We didn't know if that's where they're staying, because like I said we weren't involved in that. So we drove up there after 9:00." "So then one of the guys who was with me, he jumped out but when he jumped out - all of us got out off the car, and the guy hollered, see those guys there. My friend said, we don't have anything to do with that. We don't even know what you're talking about with a bracelet. We don't even need that. We aren't those kinds of people, you dig?" "So the guy got hyped, liquor was already in him, so he got hyped, and he started walking to my friend. He didn't know any of those guys from Adam, first time he probably saw those guys." "So the guy went to the front of me and I left him because when I stepped in front of him, he pushed me away. I don't know him, so I don't know what he would have done to me, so I stepped out of his way. You know? We aren't violent persons." "I turn back and when I turned back, it looked like those guys were looking to start to fight. By the time I took a step over to see what was going on, I heard a guy say "bwai, bwai" - when I turned around all I could remember is seeing him drop, slow, slow, slow. And when I saw that I got crazy, you know? So I ran in and I knocked the guy, and when I knocked him, another hollered, that's my brother! So he fired a punch at me. When he fired a punch at me I dodged him. And then the same guy turned and hit me with the same...gone for my face tooâ€¦with the same fire extinguisher. But I punched it down with my next hand. When I knocked it down now the whole crowd jumped me. And when they jumped me I dodged all of them and I ran around behind a hall and I hollered "boy what are you doing back here?" "And he told me boy, Kevin is down! Then a guy came from nowhere and stamped him in his face, and when he stamped him in the face, they punched him. Then the whole crowd of ten men just rushed me. I ran to the gate, and I went to run back, and those girls grabbed me and told me Kevin isn't moving, Kevin isn't moving, go get help." "Then I told him, I don't know any of those guys, but all in all I just know one guy and it's the dread guy who is always in the news, and only him I know out of the crowd, but I don't know what he did or what not, because at the same time, it's a big scuffle happening and I don't have time to be watching anyone's face, but if you show me a picture of the young boy that hit him I could show you that because it's him when I asked my friend, my friend said it's the same guy that we picked up. So if you show me...something Franklin, I don't even remember his first name"
Reports say that the person with the last name Franklin flew out of the country on Tuesday. And a you heard that witness say, quote, "I just know one guy and it's the dread guy who is always in the news," and we're assuming he's referring there to one of the Castro brothers. 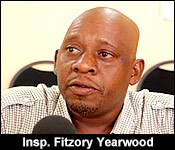 And that is substantiated by what former Police Press Officer Inspector Fitzroy Yearwood told the media. But Yearwood's statement was then rescinded by the police press office in an extraordinary disavowal. But, Fitzroy was telling the media just what San Pedro police told him. 7News has obtained a copy of the text sent by San Pedro police to the press office and other commanders. It says clearly: "Persons wanted: the Castro Brothers". We know one of the brothers was out at San Pedro, another had flown out that morning. As that witness says though, he doesn't know that Castro did anything, he says, quote, "only him I know out of the crowd, but I don't know what he did or what not...." So basically he just recognized the face from TV. Subsequent to police sending that text, they reviewed security video of the fight. Amazing now they officially announce Castro boy was involved after trying so hard to bury it !! 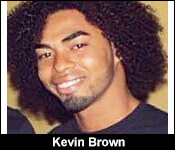 Last week, we were closely following the case of 21 year-old Kevin Brown, the basketballer from Camalote Village. You'll remember him as the island visitor who was mobbed and beaten by a group more than 10 men on Sunday August 6, during the Costa Maya weekend. In that fight, near the Banana Beach Resort, he suffered a massive blow to the head, and he's still recovering from that injury. Well, police say that he and other eyewitnesses have given statements naming his attackers, and it's a surprising turn of events. 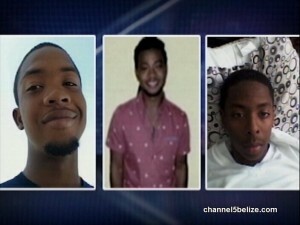 Police have issued warrants for the arrest of Gilbert Franklin Jr., James Young Jr. and Jafari Castro, son of UDP Area Rep. Edmond Castro. 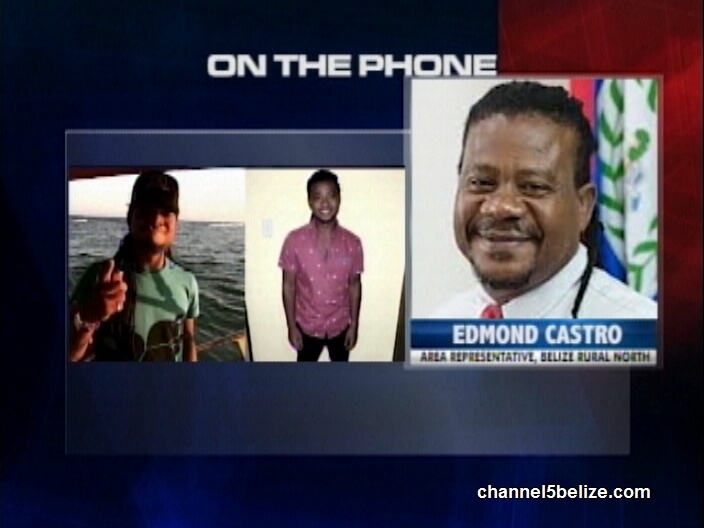 While Castro is the headline name - because of his father, the names of the other suspect's fathers: Gilly Franklin and James Young Sr are also very well known in Belize City. That report from the Police Press Office was released over the weekend, and immediately, the media started pressing the public relations personnel for an explanation. That's because, as we told you, on Thursday they were insisting in the strongest terms that the Castro boys were in no way involved in Kevin Brown's unfortunate beatdown. The only member of the press office who pointed in the direction of the Castro boys was Inspector Fitzroy Yearwood, and within hours after he released that information, he was transferred from the Police Press Office. The Police Department has again insisted that the information on the Kevin Brown incident is in no way connected to Yearwood's transfer, and today, the acting commander of Eastern Division called a press conference to make that point emphatically. "I can tell you that the investigation has led us to the issuance of 3 warrants for Jafari Castro, Gilbert Franklin and James Young. A couple days ago we managed to record a statement from Mr. Kevin Brown. And, we've gotten statements from other witnesses, which have enabled us to issue these warrants." "Can you get us a status as to whether or not he has been arrested?" "He has not been arrested as yet." "And the other persons who are under warrants for arrest?" "And not located as yet." "No, Gilbert Franklin, and James Young." Assistant Commissioner Broaster also had to explain the police department's flip flopping on the status of Jafari Castro. He answered a few pointed questions from the press on the Police Press Office's denial, and their change of position. "Can you clarify for us what may have been a confusion in terms of, at least the Castro brother being named in the first instance, and then the police department having mentioned that this individual wasn't wanted for questioning at that time, or anything involving the incident. Now, you have since walked that back to issue a warrant for his arrest." "Well, I have not walked back anything. I can tell you whilst their name was called, there was nothing official, and I believe that was the message that the press office conveyed to the media, that there is nothing official regarding that issue. We have something official now, hence the reason why the warrants were issued for the 3 individuals named." "Do you concede though, that while the police department was making that stance, that you cannot called their names, it is perceived - or can be perceived - that the police department walked back, and it looks as though it is political." "I will not concede to that. Like I said, we report on fact, and we tried our best to be accurate to the media. So, when the media asked specific questions, specific answers are given to the media." "Sir, but it appears also that Mr. Yearwood was sort of thrown under the bus. The suggestion is that he was not performing his duties well, but then, there is an undercurrent that he was irresponsible in releasing Mr. Castro's name early. Which is it?" "The situation with Mr. Yearwood has nothing to do with the Castro naming. That matter with Mr. Yearwood will be dealt with internally, and I will not prejudice that matter in the media." 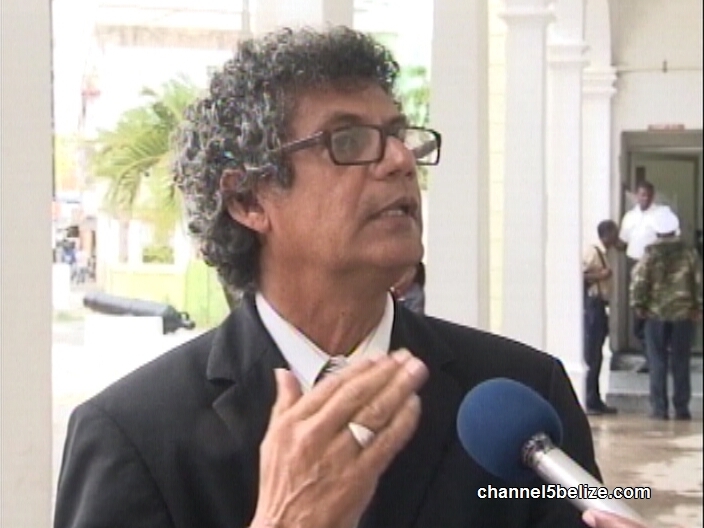 "Mr. Yearwood, when he issued the report saying that the Castro brothers were wanted, he was a member of the Police Press Office. Why did we have this conflicting information? He obviously had that information; the media had that information, but other members of the police press office were refuting vehemently that the Castro brothers were present, were involved in any way." "My final comment on this issue, with regards to that, is the fact that the Press Office, from all accounts that I've seen, stated that there is no official report against them at that time." 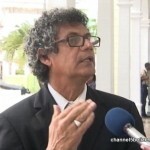 "Sir, is it a concern for you, as someone who wants to maintain the good name of the police department, that this instance - this incident - will be perceived that there was political maneuverings in trying to protect - even if that is not the case - Mr. Jafari Castro." "There is no political maneuvering. There was never any attempt by our press office, or this department to protect anybody from scrutiny." Police say that they intend to charge Gilbert Franklin Jr., James Young Jr., and Jafari Castro with harm. Gilbert Franklin Jr. will additionally be charged with aggravated assault. Police have officially arrested and charged 21-year-old Christian Espat for the August 12th shooting incident in the San Pedrito Area. Espat, a fisherman of the same area, is being charged with two counts of attempted murder, two counts of dangerous harm, and three counts of use of deadly means of harm. 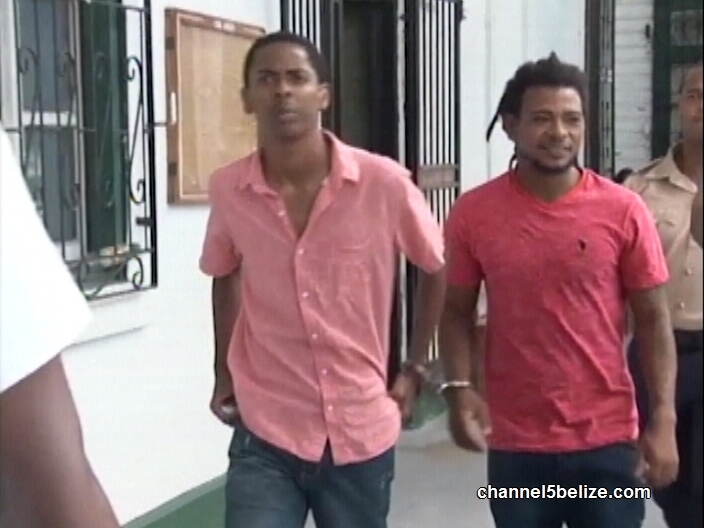 Espat has been transported to Belize City, where he will be arraigned at the city’s Magistrate Court. They were wanted for beating down Kevin Brown and tonight Jafari Castro and Gilbert Franklin Jr are in police custody pending charges. Reports say they were caught today in the Conch Shell Bay area and taken to the Queen Street police station. Police have confirmed that they are being held pending charges. Now, only James Young Jr remains at large. All three young men have well known fathers. Franklin Jr is the main suspect accused of hitting Brown over the head with a fire extinguisher 9 days ago on San Pedro. 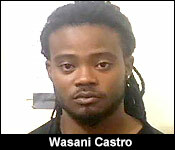 Only he will be charged for aggravated assault, and he will then be charged jointly with Castro and Young Jr for harm. Initial reports told us that they had been found in the conch shell bay area, but subsequent reports say that the Northside strike team detained them at Gilbert Franklin's home on Dunn Street, Kings Park area. They are expected to be charged for harm tomorrow. James Young Jr is still at large. Last night, we told you how 21 year-old Jafari Castro, and 18 year-old Gilbert Franklin Jr. were in police custody. 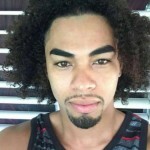 Today they were joined by 21 year old James Young Jr who turned himself in this morning. On Monday, police named them as the main suspects in the beatdown of Kevin Brown. 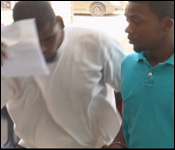 Well today, 10 days after Brown's savage beating on San Pedro, Police escorted all 3 alleged perpetrators to the Magistrate's Court for their arraignment. They were taken before Acting Chief Magistrate Sharon Frazer, who read them a single charge of harm. Police had said that they intended to charged Gilbert Franklin with the additional offense of aggravated assault, but that didn't happen before their arraignment today. So, after that single charged was read, all 3 men pled not guilty. 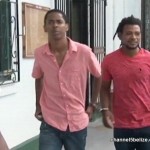 There was no objection from the prosecution, and so, they were granted bail of $1,500 each. It's a small bail and a minor charge and so most likely, they are all at home tonight. But, these young men are now facing a criminal charge, which means that they must establish their innocence in the court if they want to acquitted. "Magistrate read the charges, asked if they understood what was being said to them and because it is a magistrate court matter they were called upon to plea whether or not they were guilty or not guilty for which both Franklin and Young replied the negative, they are not guilty. 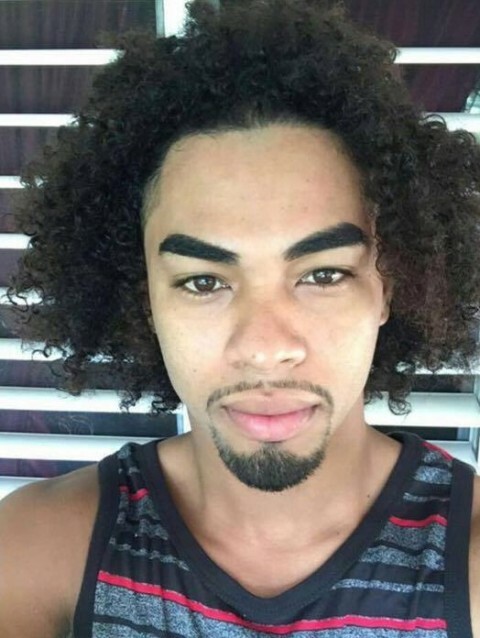 It is a single charge for all 3 persons that the cause of harm to Kevin Brown 10 days ago at night in La Isla Bonita and it arose out of some fight between two groups of young men. What Donald Trump would call the fake facts from the police is that they looked at surveillance camera but the words are the surveillance camera was viewed, they didn't say they saw anything on the surveillance camera because had they seen anything it would not have taken 10 days to bring this single charge of causing a harm. Now we will have to wait for the disclosure but we don't know if it' is 3 harm or 1 harm. The police are saying that Kevin Brown was hit with a fire extinguisher which caused him to become unconscious. This matter arose out of some dispute over jewelry, I know because the family had shared with me that in fact Gilbert Franklin had a very expensive gold jewelry on his hand which somebody grabbed and it gone missing and that may have been one of the cause of the event however they have told me that it is the other side that went to the Resort that they were and started what was the 2nd problem and also in the case of Gilbert Franklin, it is fake news to say they went and found him anywhere on Southside. They offered the moment it came on the news that police had decided they would bring charges against the 3 young men, Gilbert Franklin made contact with the police as well as James Young offering to go into the police station, they were told there is no magistrate in the island of San Pedro and that arrangement would be made for them to come in on another day however the police could not wait because I understand they wanted be on the news last night so they went and they found Gilbert Franklin at his family's home on Dunn Street, not no Southside. So I wanted to clear that up. It is a sad thing to see young people get into a fight to a stage where one is hurt that he has to be hospitalized and there is bad blood between young people because we want our young people to move away from that type of thing. This is a single charge of harm, there is no aggravated assault with any weapon or anything, somebody hit Mr. Brown in a fight, we will find out who hit because the 3 of them can't throw punch to hit him the same time and 3 of them can't hold on to any fire extinguisher to cause it." They must return to court on October 18, where it is expected that the prosecution will provide them with disclosure. 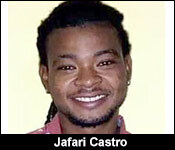 Several of Jafari Castro's family members were at court to support him, and they made their distaste for the media clear. At the end of the arraignment, Jafari's older brother, Jumoke Castro, got into a confrontation with the Krem News' camera man. Castro suspected he was being video taped, which he was very much against, and he and the cameraman had a bit of hard talk before he left. Ironically, his attempts to prevent being featured on the evening news is exactly what caused him to end up in the news anyway. 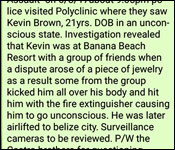 For a few days last August, the beating of university student Kevin Brown on Ambergris Caye on the night of August sixth was all anyone would talk about. 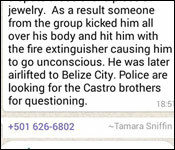 Brown was hit with a fire extinguisher, causing him to go unconscious, and kicked about, all because of a piece of jewelry. 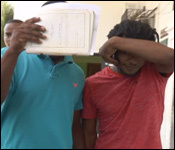 Police stumbles and fumbles led to questions about whether anyone would be charged, and eventually, the younger son of Government Minister Edmund Castro, twenty-one year old Jafari Castro, along with Gilbert Franklin Junior and James Young Junior were, for harm. But barely six months later, it all fell apart when Brown failed to show up for the start of trial on Monday. News Five’s Aaron Humes spoke to Richard “Dickie” Bradley, attorney for two of the former accused, for the inside story on how it all came down. Police said they had surveillance footage. They had statements from witnesses. They even had a potential motive. But on Monday, they didn’t have Kevin Brown in court to testify. 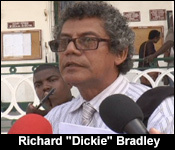 And that, said Richard “Dickie” Bradley today, made all the difference for his clients. Richard “Dickie” Bradley, Defense Attorney for Gilbert Franklin Jr. and James Young Jr.
And that is what Senior Magistrate Aretha Ford did on the urging of Castro’s attorney, Herbert Panton. But considering all the hype surrounding the case and its participants, one wonders if those who rushed to judgment last August may have spoken too soon. Bradley expressed supreme confidence in a potential positive outcome based on a look at Brown’s police statement, which has very little to say. According to Bradley, Brown made no connection to any of the three former co-accused. And so, despite his own very friendly relations with the media, it was a case of ‘I told you so,’ though he did not use those precise words. Here’s how he put it.